At the beginning of the Paleozoic (542 Ma), Laurentia was near the equator (Figure 21.2) and sedimentation was continuing on all of Laurentia’s marine margins, including the passive margin (not tectonically active) on what is now the west coast. The clastic sediments of the Windermere Group are succeeded by mostly limestone beds (represented by the blue areas in Figure 21.7) interbedded in some areas with mudstone and sandstone. 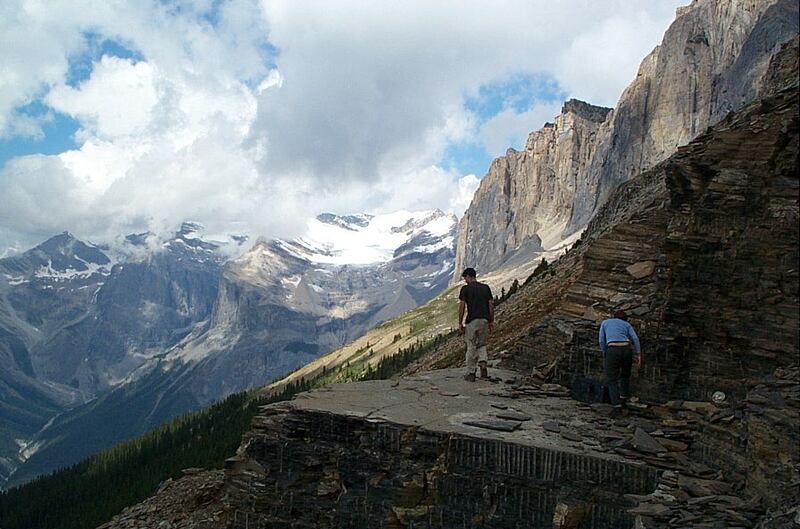 The most famous Cambrian rocks in the Rockies are those around Field, B.C., within Yoho and Kootenay National Parks. The Burgess Shale of the Stephen Formation is considered by some to be the most important fossil bed in the world because of its spectacular preservation of detail in a wide array of organisms that are ancestors to many of today’s organisms and are not present in earlier rocks. The Walcott Quarry, on the pass between Mt. Field and Wapta Mountain has been known and studied for over 100 years (Figure 21.9). In 2012 a new Burgess Shale discovery was made at Marble Canyon, about 30 km to the southeast, by a team led by the Royal Ontario Museum (ROM). Fossils with similar levels of preservation are present, and several previously unknown organisms have been found. The ROM continues to work in the Marble Canyon area and some of their discoveries are described and illustrated on this website: https://www.rom.on.ca/en/blog/mighty-burgess-shale-fossil-site-discovered-in-kootenay-national-park. The Paleozoic strata of the Rockies also include Ordovician, Devonian, Carboniferous, and Permian sedimentary rocks. For example, Carboniferous limestone makes up most of the upper part of Crowsnest Mountain in southern Alberta (Figure 21.1). While clastic and carbonate sediments were accumulating along the western edge of Laurentia, much of the interior of the continent was submerged under inland seas that were connected to ocean most of the time. This region is known as the Western Canada Sedimentary Basin (WCSB). The Paleozoic sediments that accumulated within this basin show up as the blue areas in Figures 21.4 and 21.5; however, their extent is much wider than that because Paleozoic sedimentary rocks also underly the Mesozoic rocks within most of the areas that are light green on those maps. By way of example, a schematic cross-section through the Paleozoic and Mesozoic rocks of southern Manitoba is given in Figure 21.10. The section extends from the Saskatchewan-Manitoba border on the left to just east of Winnipeg on the right, and shows the Paleozoic rocks overlain on the rocks of the Precambrian Superior Craton. Fifteen different Paleozoic formations, ranging in age from Ordovician to Carboniferous, are shown in Figure 21.10. Of these, 11 are dominated by carbonate rocks (limestone or dolomite) that very likely formed in an ocean-connected marine environment. The non-carbonate formations are the lowermost one (resting on Precambrian rocks), which is sandstone of marine origin; the Devonian Prairie Evaporite Formation (in red) — the same formation from which potash is mined in Saskatchewan; and the upper two Devonian formations (in yellow), which are shale. When the Prairie Evaporite formed, the basin was isolated from the open ocean, and the rate of evaporation was greater than the rate of input from precipitation and river inflow. During that time, probably at least several million years, there were numerous changes in sea level or land level that allowed additional ocean water — and therefore additional salt — into the basin. There are Paleozoic rocks in the central and western parts of British Columbia and Yukon, but they formed far away and did not become part of North America until the Mesozoic. Subduction started along the western edge of Laurentia by the middle Paleozoic. That meant that oceanic crust was moving toward the continent, bringing small segments of exotic continental crust with it (Figure 21.11). These crustal blocks along western North America are called terranes, indicating that they are sections of the continent that have an exotic origin (Figure 21.12). 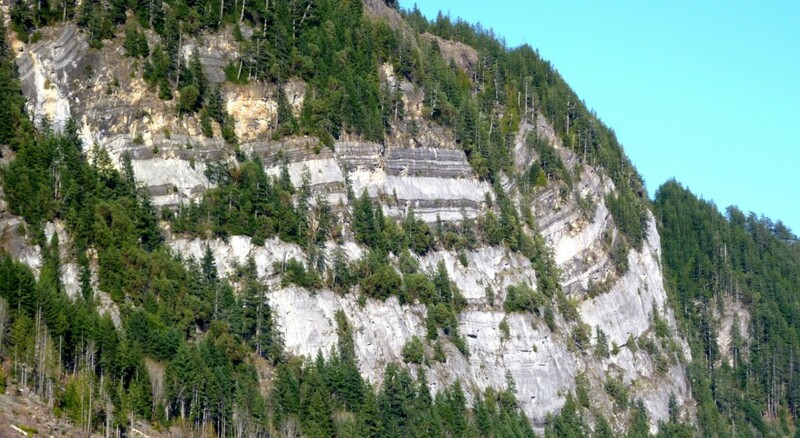 Most of British Columbia is made up of terranes that include sedimentary rocks with fossils that imply an origin south of the equator, or volcanic rocks with magnetic orientations that indicate a southern-hemisphere origin. Exercise 21.3 What Is Vancouver Island Made Of? 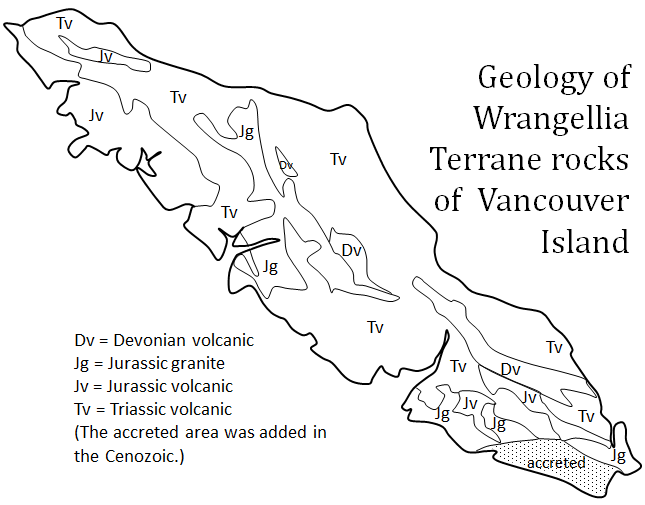 This map shows the main geological features of the Wrangellia Terrane rocks that were present when Vancouver Island arrived on the coast of North America. 1. Roughly what percentage of Vancouver Island is underlain by Paleozoic rock? 2. What is the most common age and type of rock on Vancouver Island? 21.3 Western Canada during the Paleozoic by Steven Earle is licensed under a Creative Commons Attribution 4.0 International License, except where otherwise noted.